After detecting a network breach it is a good idea to scan the network for further Indicators of Compromise (IoC) to check for further malicious activity. The IoCs are usually derived from forensic investigations into network packets and compromised hosts, and can be quite unique when it comes to more sophisticated attacks (let’s avoid mentioning the APT buzzword here… oh, wait… darn!). The major problem with network based IoC scans are that the rate of false positives heavily depends on how specific/unique the attack patterns are. Which is something they have in common with most IDS signatures. Best case would be a pattern that is never present in harmless network traffic. Unfortunately, those patterns are pretty rare, so in most situations an ongoing scan turns up hits all the time because of the patterns matching something that may be good or may be evil. An example would be a copyright string found in a C library that is used in a malicious binary, but could also be part of a software that the company uses everyday. Assuming you already have indicators of compromise collected from an investigation into a compromised system or network, the next task is to examine other network captures for occurrences for those patterns. This can either be done on a network security monitoring (NSM) device constantly scanning network packets, or simply a stack of pcap/pcapng files that you captured previously. 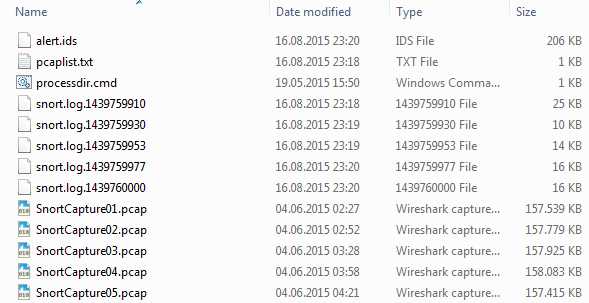 Now, looking for IoCs in a ton of capture files with Wireshark is certainly possible, but not a good idea. Filtering in Wireshark is incredibly powerful, but you just do not want to scan a lot of files for patterns that way. 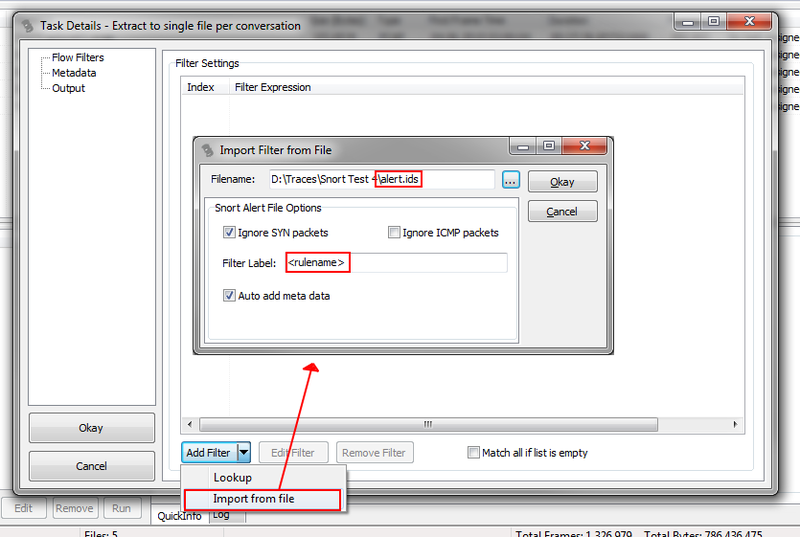 Even when you script tshark into doing the filtering automatically, it’ll be too slow. This results in a file called “pcaplist.txt” containing a list of original pcaps similar to e.g. c:\Snort\bin\snort.exe --pcap-file pcaplist.txt -pcap-show -c c:\Snort\etc\snort_ioclist.conf -l .
Acquiring network traffic from "SnortCapture02.pcap". Acquiring network traffic from "SnortCapture03.pcap". Acquiring network traffic from "SnortCapture04.pcap". Acquiring network traffic from "SnortCapture05.pcap". Imagine you get a signature match telling you “Possible Call with No Offset TCP Shellcode” – this is something that tells you something bad may be going on, e.g. someone trying to run an exploit and most likely establishing a remote shell. Now, the packet you look at is on an HTTP port and contains nothing but a lot of seemingly random payload bytes, including the sequence “E8 00 00 00 00 58“. Now, is this a really problem? Or is it just a false positive? where is the target system? Is it a client? Is it a server? If it’s a server, where is it? In the DMZ? In the internal net? where does the packet come from? The internet? From another internal system? Do you have additional hits on the same source/destination IP address pair? This is HTTP, so what was the host name this is coming from? Is it from “www.evilhackers.com”, or just from a site with a much better reputation? What was the user agent? There are tons of other interesting things, but they all have one thing in common: you cannot answer them from your single packet with the signature match. What you need is the full TCP conversation from start to finish (or UDP/ICMP request/response pair). With that you’ll often have enough data to make a decision. BTW, the example above often happened to me frequently when someone was listing to a web radio station. So when I see the HTTP request leading to the signature match being “http://www.wdr.de/wdrlive/wdrplayer/wdr2player.html” (with “WDR” being a German radio station) and then hours of audio streaming, I can mark a “shell code” hit as false positive. Oh, and can you imagine going through dozens of large pcaps, backwards from the one with the signature match to find the GET requests about 5 hours earlier? It’s so annoying! Well, to be honest, in Germany (and probably other countries) you’re should consider yourself lucky when you have full packet captures at all – often enough those are not available since the company couldn’t get into an agreement with the workers council for this kind of thing. Don’t get me wrong here: I’m not in favor of unrestricted/unsupervised network surveillance. Full packet captures are really important to be able to protect the network by doing a full packet inspection. But at the same time it must be made sure that those packets are only examined as part of an authorized investigation. As you can see, this isn’t fun. And it gets a lot slower if you do it manually – I had a case where I had to verify hundreds of signature matches. It took forever (which is a big problem in an Incident Response situation when time is critical). 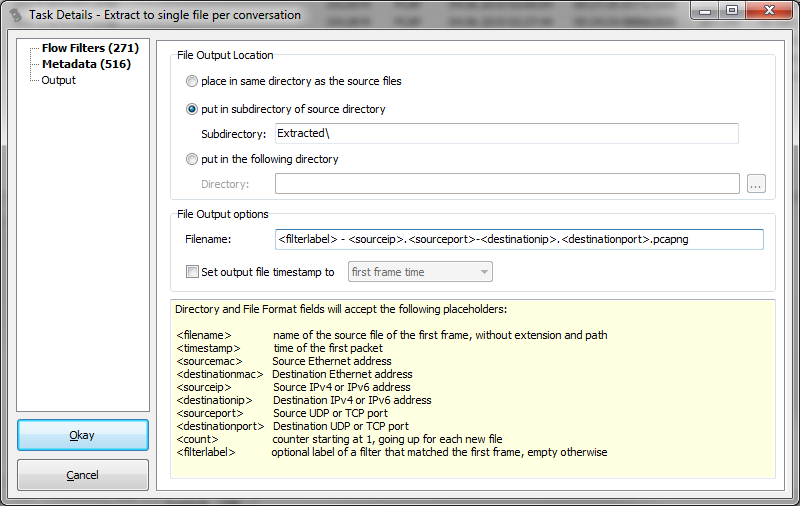 TraceWrangler can run “Extraction” tasks, basically allowing you to specify a list of conversation filters and an output name schema. Let’s assume you have 10 conversations that are spread across 5 capture files. 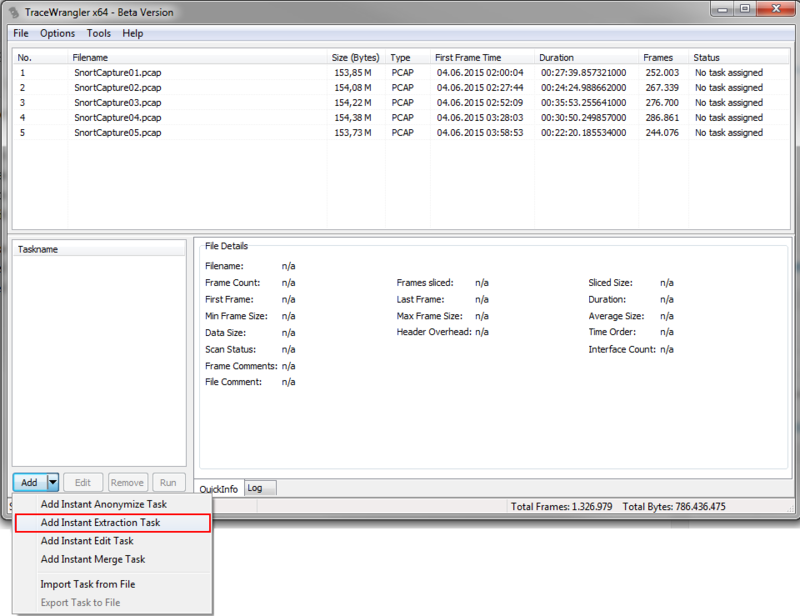 TraceWrangler will read all of those files, look for the 10 conversations at the same time, and write all packets belonging to the same conversation into a separate file. You’ll end up with 10 files, each containing one of the conversations you want, with a file name you want. 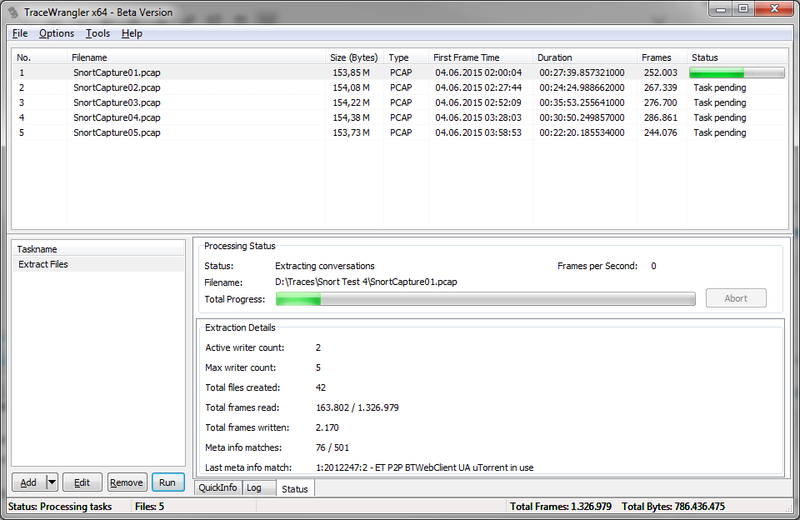 So lets add our set of pcap files to TraceWrangler and add an extraction task. This kind of task is only available when all files in the file list have been scanned first, so if your files are really large and exceed the autoscan threshold you need to force the scan manually in the file details pane. So instead of adding filters by hand, we chose to import them from a file, which will open a new dialog where we can specify the file as well as some import parameters. Here, we’ll import the alert.ids file generated by Snort, which will allow us to automatically add meta data records as well. All conversations will be stored in a sub directory of the path where the original pcaps, and each file will start with the label of the filter followed by the socket pair that the filter was specifying. For those signatures where TraceWrangler had meta data with TCP sequence numbers (or the IP ID for UDP & ICMP) available it marked the packet with a comment which had the Snort signature match, as you can see in packet 4. This makes it a lot easier to see where the IoC pattern was actually detected. Seems you’re rapidly adding useful features to TraceWrangler!